← Michael Fabricant: away with the fairies? It has become evident over the last few months that some shuffling of position has been going on over the retail future of Brownhills town centre. There have been a couple of articles in the local press about how Tesco were hoping to submit revised plans for their apparently utopian new retail facility, but nothing substantial. Detailed layouts are continually, teasingly a couple of months away, or sometimes just about to be submitted, but the company itself clearly won’t talk about them, its’ intentions toward the town, or for that matter, the customers it serves. Even, it would seem, to Walsall Council. From the Express & Star, 15th December 2009. Click the image to read the article. Since our local authority decided to publicly go cold on the subject way back in June 2009, pretty much nothing was said on the matter until the Express & Star printed a bit of a non-story last December. Rather tellingly, at around the same time, another story materialised about planned changes to traffic flow around Brownhills as part of the red route obsession currently exciting our town planners. In short, our masters were going to take the easy way out and just make Silver Street two-way, rather than the fanciful, more expensive options that they’d postulated before. It was almost as if the goose was no longer going to lay a golden egg, and all very peculiar. Against the backdrop of apparently lowered expectation, the market was taken out of the original operators hands, closed, then re-opened when Walsall realised what a bollock they had dropped. Previously, the market had been on the death list, prematurely and eagerly consigned to history by some, but reopened and promoted for a few months by Walsall Council themselves. Fast forward to last Sunday evening; my phone beeped to tell me that I’ve recieved a press release by the Council, which their press officer, Dan Slee, seemed rather excited about. I read it carefully, but failed to see the good news in it. I’ll reproduce it here, for your perusal. Brownhills market may be moved into a new High Street location as part of ambitious multi-million pound plans. Talks are taking place to make the market more central rather than in its present Silver Street position. A new market square could take shape on the High Street as part of a major redevelopment of the town with a proposed new supermarket built by Tesco. The move to a new home could boost shops as well as market traders and well as be a major attraction for shoppers. Councillor Adrian Andrew, Walsall Council cabinet member for regeneration who formulated the new market square idea, said: “We are talking to Tesco and town centre traders about creating a more central market square in the town. “We took the bold move to resurrect Brownhills market in the summer after it had been left to spiral into a slow decline. “It had been closed for some months but we revived it when others did not want to know. “We knew that any retail venture at a time of recession was going to be difficult but this was a chance we were willing to take. “The pilot Tuesday market has not taken off which is disappointing and that will stop after January 19 but the Saturday market has been more popular. “We remain very committed to Brownhills market and we do thank everyone who has supported us so far. The current Silver Street location stands at the edge of the town centre. A planning application from Tesco is understood to be imminent. Walsall Council has experience in managing markets across the borough in Bloxwich, Willenhall, Darlaston and Brownhills as well as the 800-year-old Walsall market. For more information about booking a market stall across the borough call 01922 721139 or email marketsadmin@walsall.gov.uk. I have to hand it to Dan, this release was really quite slick; it was a very sly way to bury bad news. The only concrete fact this message contains, is that the Brownhills Tuesday market is to cease from this week. Every single other point in this upbeat, jolly missive is hypothesis, suggestion and aspiration. Lets look at it closely. The market may move to a new High Street location, which could boost shops. If they are multi-million pound plans, they are not those of the supposedly hard-up council, but Tesco. The market square isn’t the suggestion of the retailer, but of Councillor Adrian Andrew, who appears to be clutching at straws. Remember, this was to be a grand development featuring homes, retail units, atria and cafes, all of a sudden we’re pleading with them to give us a market square. The other point to note is that of the square itself; there’s currently only really central space for it in Ravens Court. Councillor Andrew couldn’t possibly be suggesting that… no, that would be preposterous. In short, there’s not even a planning application yet, it’s still ‘imminent’. The time taken to get this development, and ergo, the central market square off the ground would surely be years rather than months. What they’ve just attempted to do is buy off their failure with the Tuesday market by promising you jam, in ooh, a couple of years. Maybe. If Tesco don’t mind. I’m afraid that’s just patronising tosh. Dan, who usually does an excellent job in the face of sometimes highly unpleasant criticism, should know by now that we may just be citizens of Walsall, but a sizable percentage of us can think, analyse and read without moving our lips. Serving up cobblers like that and expecting us not to see through it is hopeless optimism at best and a rank insult to our intelligence at worst. We expect better, even from this dysfunctional council. Fortunately, even the Express & Star saw through it, and led with the end of the Tuesday market, probably to the annoyance of the press office. 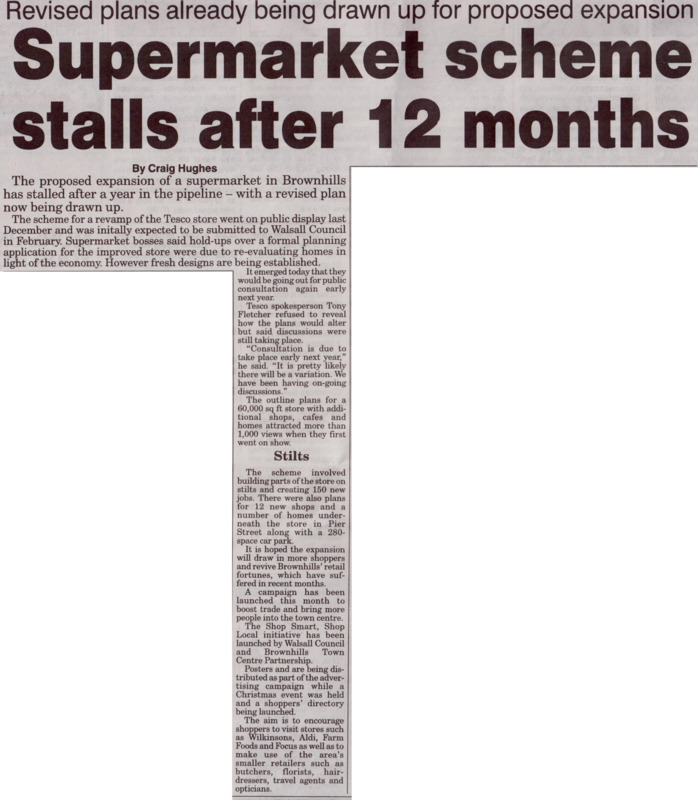 I still wholly support Brownhills market and consider it an essential part of the town. I think it’s very sad that the Tuesday Market has failed, but it was cursed by the hiatus created in the dithering of the authority, who didn’t boldly step in but acted out of desperation after their protracted prevarication started causing concern among traders in the town. After weeks of negative reporting and negotiation, the market ceased; when it reopened, it was heavily promoted for a month or so, but it was noticeable that there was little publicity over Christmas concerning seasonal opening hours, and any reference to it was conspicuously absent from statements about market opening during the recent inclement weather. Having launched in a blaze of publicity, it seems the market suffered from failing expectations and institutional neglect. None of this was helped by the extortionate charges levied by the council for stalls, which were more costly than other markets in the borough. An about turn came too late, long after the damage was done. Soon, they'll own all our arses. Reading the article about new Tesco proposals for Bloxwich on the YamYam, I note there is a feeling there that Walsall is deliberately trying to execute Brownhills market to enable a Tesco development. Whilst I think that was probably the case initially, in the information vacuum that clearly exists since the retail giant’s enthusiasm wained, I think that the Council are now desperate for anything they can get. All over Walsall, the planners have rolled over meekly while large retailers have erected monstrous sheds with little criticism or restriction. Tesco got the site of Walsall’s college to build a new hypermarket, building a new one out on the ring road, on a site with no public transport links whatsoever. Look at the hideous Asda edifice on Church Hill, or the monolithic Morrisons that now seems to be filling in for now departed industry in Willenhall. Tesco got what they wanted in Aldridge, Walsall Town Centre, and surely will in Bloxwich. My fear is that in Brownhills, the burghers don’t appear to have any kind of development plan that doesn’t involve Tesco or their cash. One can scent the odour of the last-chance saloon in every statement the council makes, and now the plans seem to be being scaled back, one can only wonder what’s in store. I’m not sure if it’s sloppy journalism, but I couldn’t help noticing that the Express & Star has referred to the Brownhills Tesco store being ‘revamped’ rather than rebuilt on a couple of occasions recently. That may just be the most informative statement we’ve had on the subject for months. This entry was posted in Brownhills stuff, Environment, Express & Star, Followups, It makes me mad!, Just plain daft, Local media, Local politics, planning, Spotted whilst browsing the web, Walsall Council and tagged Brownhills, Brownhills Market, Brownhills traffic, Dan Slee, Express & Star, Local politics, Redevelopment, Tesco, Tesco Aldridge, Tesco Brownhills, Tesco Development, Tesco Walsall, The YamYam, Walsall, Walsall Council, Walsall politics, Walsall press release. Bookmark the permalink. Another example of Captain Cluless’s (M. Bird) administration U-turning furiously and going round in circles. Clearly the good Captain doesn’t have any vision for the borough so he leaves his cabinet members to flounder about, making fools of themselves. The CoOp is leaving Walsall town centre for Leamington Spa – you have to ask yourselves why the council isn’t doing more to attract and retain these businesses. Brownhills has a decent-sized population, fair-to-middling employment levels and, more importantly an exisiting store. This store will have given Tesco huge volumes of statistics (via its Clubcard) about buying habits, lifestyle, income and more. They will know to within a couple of hundred metres how far people travel to visit the store, how often they visit, how much they spend and on what. This will give Tesco very detailed projections for sales forecasts for stores of various sizes (and I bet they’ve modelled dozens of options); this will give them cost/profit projections and more. The only big variable in this immensely detailed calculation will be what Capatain Clueless and his cronies can or will contribute. At the moment that is contribution is ‘nothing very much’ so Tesco can afford to sit back and wait because they’ve already got a store, thanks very much. If the council really wants to attract a shiny, new store they’ll have to come up with a bold plan for the area that will really drive traffic . And by that I mean they’ll have to do more than drop the rent on the market stalls. Sadly, this lack of master plan is another example of the Captain’s missing leadership and imagination.